Women working out–sometimes I think we believe the concept was invented in modern times. It’s true that my mother wouldn’t have even considered it. Nor my grandmother. Dumbbells haven’t changed a bit since the fourth century AD, have they? And women worked out even back then. I mean, who knew? That’s right, Fourth century AD. How about the medicine ball? These girls obviously did love to frolic as they worked out and what’s more, they don’t seem at all bothered by the size of their thighs. By the way, these mosaics and others even more impressive –some 3,500 square meters of them–were found surprisingly intact at the Villa, which is one of the best preserved villas anywhere in the Roman Empire. And we should know–we spent about three hours exploring them. It’s believed the mosaics were the work of North African craftsmen. The villa’s owner? Wait for it…. a politician. That is so cool! Thanks for sharing this with us! Oh wow this was insightful. Yep girls just wanna have fun. These do look like fun girls! 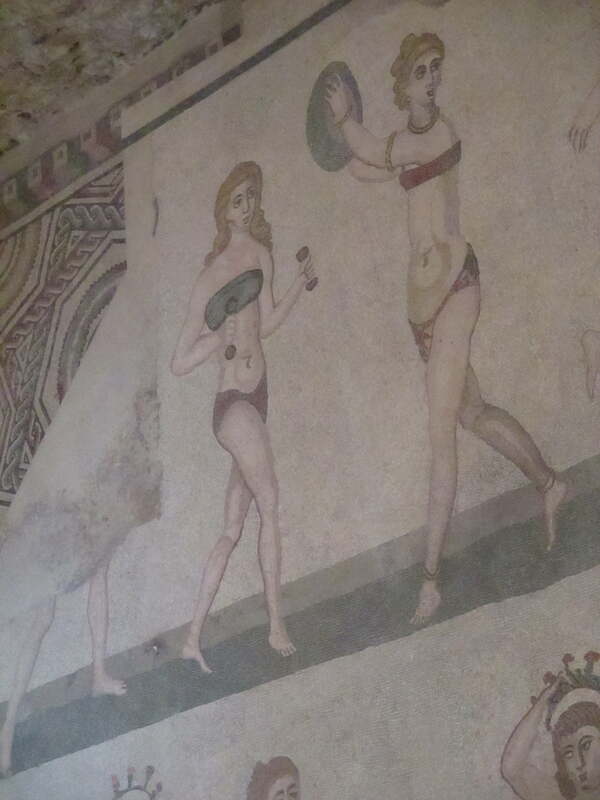 Carol, I had no clue there were mosaics that showed women exercising! Way fun! I’d love to use this as a guest post on Friend for the Ride. No pressure, only if you’d like to share. I think their thighs look pretty good. Hard to believe that the 4th century had dumbbells, though! That was a big surprise to me, too. I had no idea. Thank you so much! Beautiful! And a few of those women have bellies! I am so tired of our modern obsession with bodily perfection. I love those girls! Not specifically, but there is a long history of Moors. What a cool find. Interesting to think about how women saw themselves within a culture so far removed from what we know. I love this stuff! Thanks for sharing. I would love to know more about how women saw themselves back then. Such a fun post Carol. 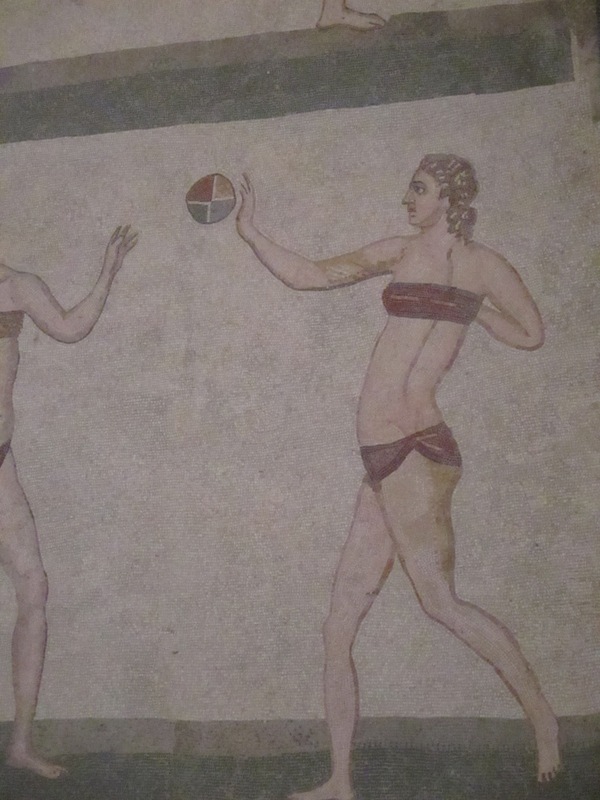 Exercise and bikinis way back then…I had no idea! And we think we’re so smart, here in the 21st century! Great pictures, Carol. This post is so up my happy, active alley! Love it and the pics you took. Isn’t it amazing how “modern” they look? I know! They could be at my gym. Love these murals (you know I would!). And Kymberly is right, they look really contemporary. They would be an awesome addition to any women’s gym, don’t you think? Oh they would be. If you could afford it! They are priceless antiquities and I’ll bet all rights are reserved! I love this, Carol. I had no idea, and they are in much better shape than I am. Well, Cindy Lauper wrote Girls Just Wanna Have Fun, but these COULD be California girls! Amazing! Several of those pictures could have depicted the modern day. I mean – boy shorts? Those girls were stylin! I’ve seen pictures of these before and was just as inspired! So jealous that you got to see them in person. Did you take a class? Hahaaaaa. Cheryl Nicholl recently posted…Who Are Your People? Genius Women! I especially like the one with the tara on her head! Rosie Battista recently posted…What is it Wednesday 5: That’s Peachy. That’s amazing! If you think back through all the history between dresses and women’s rights who would have thought that women from that long ago would be closer to how we are now than other periods even as close as our own parents! Amazing! But where are the water bottles? Those are so great! Yes, girls do wanna have fun. Always have, always will. maybe they ran out of mosaics…. LOVE it!!! The dumbbells are way to light, though… They didn’t understand the research back then (obviously…) but the problem is that women still (to this day) are using weights that are too light. As far as them having fun while being physically active is AWESOME! I suspect they got plenty of exercise in every day life. Then again, maybe not. This just blows my mind. And almost makes me believe in time travel. It’s as if somebody from the 21st century went back in time and started a 4th century health spa. It’s most likely the other way around–that there is nothing actually new in the world. Angela Weight recently posted…Do you suffer from Escalophobia, Genophobia or Mycophobia? I fear for you. This is so funny to think about. 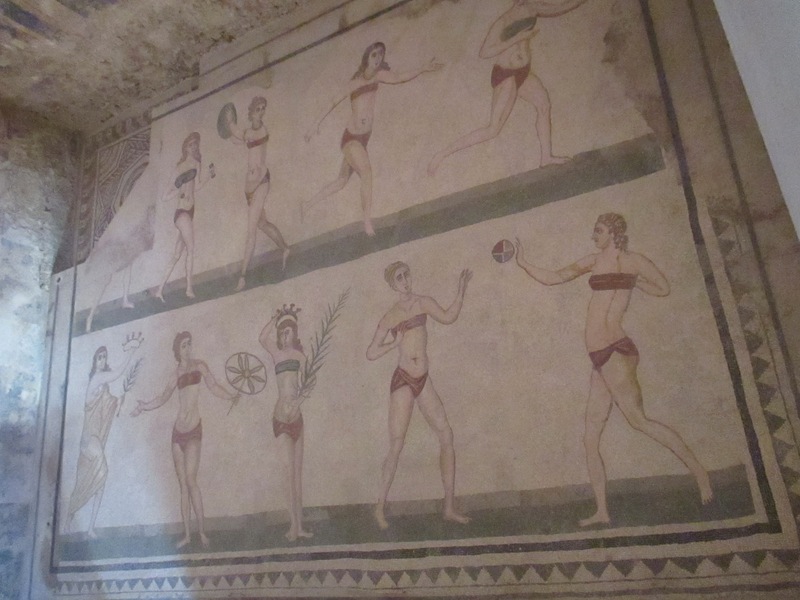 I noticed many similarities on my recent visit to Pompei, Italy. Wow! When we visited Greece back in the 90’s and went all over the islands and mainland I don’t ever remember seeing women athletes! It was all about the men. Shows that your ancestral relatives were much more progressive! Who knew is right! Unexpected discovery for sure in ancient ruins! Love how you captured the details and presented this in a fun way!